A selection box of Biscuits for Cheese containing our Original Crackers, Cornish Buttermilk Biscuits, Rosemary Wafers and Poppy & Linseed Crackers. IngredientsSee individual products for ingredients. Our delicious new Biscuits for Cheese are the ideal accompaniment to a cheese board. 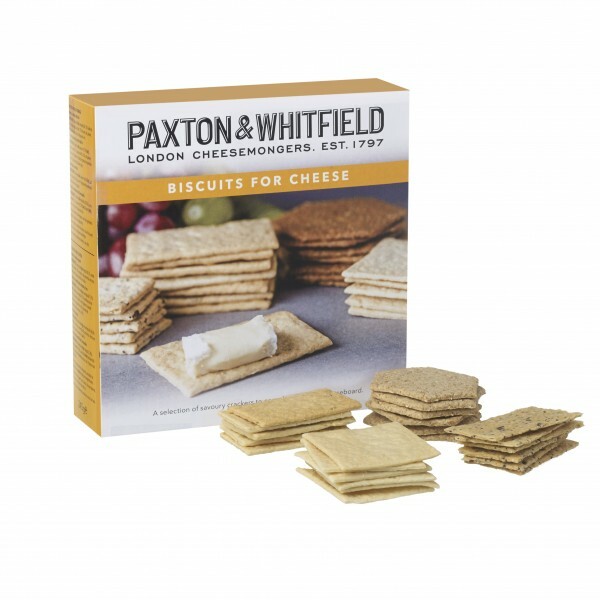 They are produced by an artisan bakery in the heart of the West Country, using the finest ingredients to brand new, exclusive recipes, developed with Paxton & Whitfield. Original Crackers 50g - A plain, savoury cracker with a satisfying snap to accompany any style of cheese. Cornish Buttermilk Biscuits 50g - Complementing the flavour of blue cheese, these slightly sweet, crisp, oat and wholemeal crackers are enriched with Cornish Buttermilk. Try with Stilton or Gorgonzola Dolce. Poppy & Linseed Crackers 75g - Ideal with strong flavoured hard and soft cheeses, these light, buttery crackers are packed with poppy seeds and linseeds, lending them a nutty, toasted flavour. Try with Montgomery Cheddar or Epoisses. Rosemary Wafers 75g - Perfect when paired with fresh tasting territorial and soft cheeses, these light and delicate all-butter crackers, with a crunchy, wafer thin texture, have been subtly flavoured with Spanish rosemary. Try with Wensleydale or Camembert. Suitable for vegetarians. For ingredients lists and nutritional information, see the individual products.